The curtain raises on another successful Play'n Go production, this one called Imperial Opera. It is an Asian Opera-themed slot which derives its strength from three main features: the free spins, the Harmony Bonus and the Crescendo Bonus. 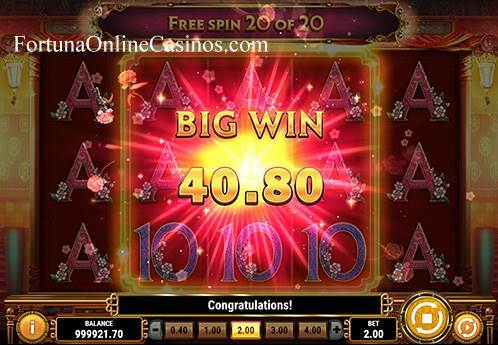 Played on 5-reels and 20 fixed paylines, the developer states a maximum win of 500x bet! It might be appropriate to describe the artwork in Imperial Opera as elegant, colourful and intricate – a mirror reflection of a real-life Chinese opera performance. This is one of the most stunning slots in its genre and the soundtrack only serves to accentuate it, containing a traditional instrumental Chinese tune. Using the thematic colour of red, a colour believed to symbolize good fortune, you can see the interior of the opera house behind the reels. The smart-looking red reels hold symbols that include three costumed characters which is then followed by the less thematic five poker symbols: A, K, Q, J and 10. We recommend trying Imperial Opera slot for free here before playing with real money, so you can get a feel for the game and see if you like it. If you'd like to explore this Asian-themed music slot for real money, you can find it at one of the casinos listed below. Starting with the positives, we can't say enough about the artwork and soundtrack which is equal to or better than most other slots of this theme. The features themselves are entertaining enough. We managed to trigger and even re-trigger the free spins more than once, where we managed to connect on some higher wins. Still, this is a very high variance slot meaning we did find it more difficult to win. This slot is suitable for a player with a high risk appetite, and ready to play with a bigger bankroll. 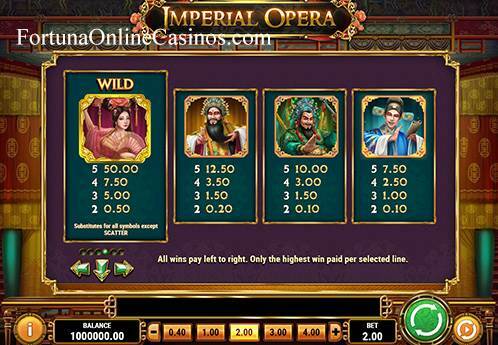 Imperial Opera slot is fully optimised for mobile, tablet and desktop. To enjoy the performance, all you'll need is an Android or iOS device. The magic of the opera begins with the Chinese Princess who represents the wild in this video slot. She may appear on any of the reels and substitute for all the other symbols except the gong scatter. You can also be rewarded when she is presented after a spin on the same payline in numbers of 2, 3, 4 or 5. In this scenario you will be credited with your total bet multiplied by 0.25x, 2.5x, 3.75x or 25x. An extension of the wild symbol, the Crescendo Feature is randomly triggered during regular games and involves one or two reels that become fully stacked with wilds. The Showcase Feature does not need to be unlocked in order to be of benefit to you. That's because you automatically benefit from it on each spin. How it works is that a random symbol other than the scatter will be selected to appear as stacked which may lead to better odds of creating wins. Also, the costumed characters may appear as mega-sized symbol, occupying up to 3x3 spaces which also increases the tendency of forming large paylines. The Harmony Feature is appropriately named so because this randomly triggered feature synchronizes two or three reels in perfect harmony. Only during this feature, can you find instances of the 3x3 sized scatter symbols which, when fully displayed, instantly awards 10 free spins. When the free spins feature is running, the middle three reels remain synchronized with the Showcase Feature active. Free spins can be re-triggered while it is still running.